In addition to being Australia's leading custom stencil manufacturers, we also stock a comprehensive range of standard stencils in our on-line shop. 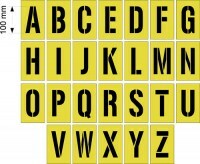 We have Letter Stencil Sets (A to Z) and Number Stencil Sets (0 to 9) in a range of convenient sizes from 50mm (2") to 600mm (24"). Our letter and number sets are designed to lay together evenly, stack neatly, are easy to clean and best of all, affordable. Large selection of commonly used designs in a variety of sizes are now in stock and ready for shipment. Please contact us if you don't see what you need and we'll be glad to help! With over 10 years designing and manufacturing Road Marking Stencils we understand your requirements. Designed to comply with VicRoads Design Standards wherever possible they look as great as they perform! Easy to transport, "shake-to-clean" and a huge saving over old fashioned aluminium! Most of these are in stock and ready for immediate shipment. Here you will find common words and symbols to suit car-park and lane-way marking. A selection of Playground Stencils for use in school and public playgrounds. We have developed a specially formulated material with extensive field trials in normal and extremely harsh conditions. This poly-plastic material far out-performs old fashioned aluminium and zinc stencils. Best of all, it's less expensive, and you get the savings! Though we still make aluminium stencils by request, this new material is easier to transport, highly solvent resistant and has been surface treated with a special "shake-to-clean" coating. Not only is our stencil material 100% recycled, it has been certified as a 100% CARBON NEUTRAL PRODUCT! If we don't stock it, we'll make your stencils to order - corporate logos and fonts are our speciality! Fast turnaround times, professional service and expert advice is just the beginning. You'll be "wrapped" with our stencils! Request a quote now or browse our Online Stencil Shop where you can view all our products and order them online. Just a few clicks of your mouse and your stencils are ordered and as good as on their way! 1.5 mm2.0 mm1.6 mm Alum.